Nobby is a premium, fully responsive, Retina-Ready WordPress theme with a minimal, clean design that allows visitors to focus on content. An ideal WordPress theme for novice users and designers is the one that provides all website elements (header, page and footer) in front-end editor by visual mode and also brings ability to edit the settings in real time. Now designers dream come true and by Nobby theme you can design your website just like Photoshop application. This is a unique feature of the Nobby theme, you can do entire edit operation (header, pages, footer) in front-end environment. With Elementor page builder, you edit the page and simultaneously see exactly how it looks like. Elementor features live design & inline editing, so the whole process of writing and designing is done directly on the page. Elementor within Nobby theme has unique features. 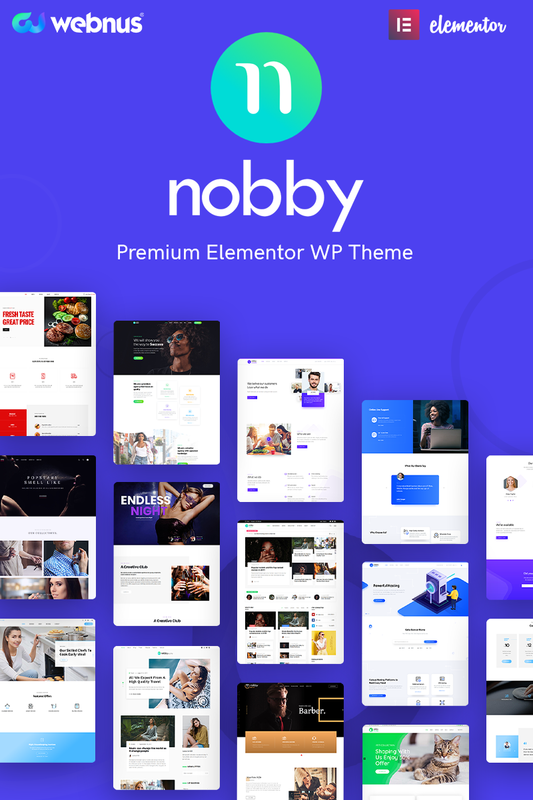 You have access to all the Nobby theme shortcodes as elementor widget and you can easily create all Nobby demos using elementor. We claim that Nobby theme header builder is the best, most powerful and also most customizable tool to create header in the world and there was no feature such as this one. By this tool, in visual mode (back-end editor or front-end live editor) you can build your desired header with drag & drop. No longer worry about footer design restrictions. In Nobby theme, you have all the options to design page so you can create and design your preferred footer in visual mode. There is no limitation. Complicated layouts, menu, background, shortcodes and anything that you need are ready for you by Nobby theme to design your desired mega menu. Just imagine and then easily design mega menu in Visual mode. The Nobby theme brings full options to build an online shop. This theme is Powered by WooCommerce, the most popular eCommerce platform. This theme is based on a modern and minimal design using ajax technology provides a very unique and practical experience to users. This theme is appropriate for all kind of shops like cloth, electronics, furniture, accessories or any other known kinds. Google Map shortcode in Nobby theme is advanced in a way that you have never seen the sample of it before, it contains many features and provides maximum customizability for you. Most of Google map API features are included in this shortcode. The Nobby theme can easily be translated by using the po and mo files or you can use WPML Plugin if it is needed, so the theme is available in your language too. One Click Demo Importer - Easiest and fastest way to build your website, one click imports header, footer, pages, posts, sliders, widgets, theme options and more! To design agencies and for creative people who intend to introduce their work on web, portfolio has vital importance which Nobby theme covers this specific need. Child Theme Ready - Create child theme starting from included dummy child theme. Parallax Effect Backgrounds - Nobby supports parallax backgrounds depending on cursor movement. You can easuly add parallax backgrounds to every page sections. Modern websites use animation to show better their content. Scroll animation is one of most interesting ways of animation for page elements. Scroll animation, in fact, is creating animation (change position/size/opacity...) during page scroll according to position of each element. Cross browser compatible - tested in IE 10,11; Firefox; Safari; Chrome and Opera. Any media - Photo, video used in preview are not included in this item and you need to contact authors to get permission in case you want to use them in your commercial or non-commercial projects.